Travel with Kevin and Ruth! : Namibia change of plans! We know our trip is still a few months off, but we want to keep you all updated as to our plans. It turns out that the little 4 wheel drive motorhome we had wanted is already sold out for the dates we wanted it! So, good thing we are flexible. We could have opted for a larger RV, but that's really not what we were looking for. Plus, the extra cost would have reduced the number of paid days we were receiving. So we decided to go the other way. By getting a 4 wheel drive Toyota Hilux with a rooftop tent and all of the camping gear we will be able to extend the paid for portion of the trip. This is the style of camping rig we're looking at! Our tour operator Christine at ATI Holidays has been GREAT at putting up with all of the changes and things that we've asked for, and now she's seeing if the reduced cost of this unit versus the motorhome will allow enough extra days to take us up through northeastern Namibia and into Zimbabwe and the world famous Victoria Falls. 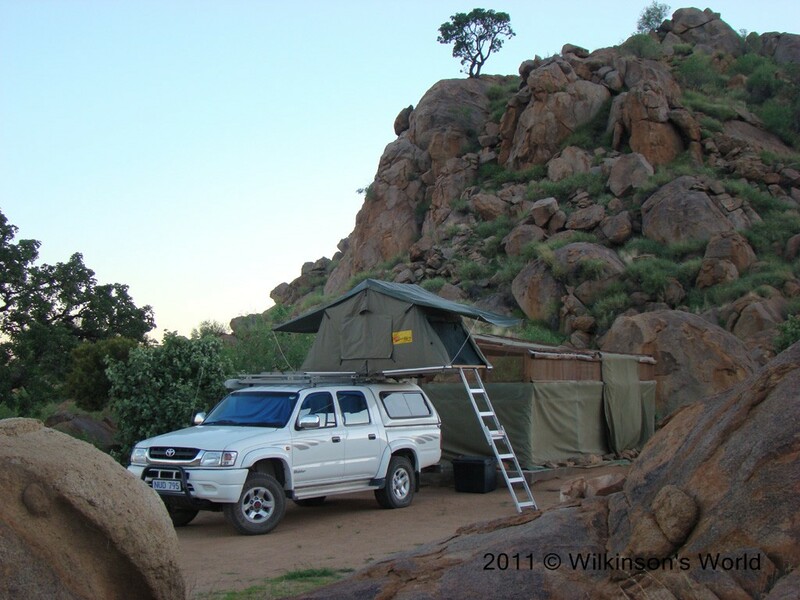 Looking at the benefits of this style of camping...the weather is always great in Namibia at that time of year. It will be hot and sunny, so this should be actually a little cooler than the motorhome style would have been. And, an easier style of vehicle to go anywhere. The main drawback is the lack of a toilet, but we'll be staying in campgrounds most of the time anyhow, so we'll just deal with it. It does come with all the gear, and the vehicle is of course set up for wilderness camping. Extra fuel cans, two spare tires...that sort of thing. Your camping equipment includes the following: rooftop tent with mattress and mosquito net, free of charge bedding on request, folding table, folding chairs, braai-grid, braai-set (bbq), coolbox, fridge, cooking utensils, cutlery, crockery, storage box, gas cooker with gas cylinder, gas lamp with gas cylinder, spade, water & petrol canister. Bedding includes sheets for mattresses, sleeping bags (-10), pillows & pillow cases. It's not booked yet, so things may change still...we'll let you know what the final schedule will be as soon as we're confirmed! This is going to be very a interesting trip. Looks like things are looking up again. Things are always looking up! I love it, totally awesome. I would do it!!! It sure is going to be a fun adventure for us! Everyday is an adventure. I love planning for a trip, it is almost as much fun as the trip. You are right, it is almost as much fun. It is fun planning it and then being able to live out those plans. We can't wait to get there! We saw a similar setup a few years ago in Italy. Could be interesting on windy nights. I think that they are starting to become more popular over here in North America. a number of overlanders have set ups like this. Hopefully we won't see any windy nights! I am not looking forward to that part! I think that there won't be any after dinner drinks, at least for me, anyhow. I forgot how cool that dog was!! Yep, Miky had quite the personality, he was a fun dog and we enjoyed our visit with him. It just gets more exciting as time goes by. All the changes and flexibility make for a really fantastic adventure! I know you'll have a wonderful time! Good thing we don't mind the changes that crop up, we are just really happy to have the opporunity to go. It is wonderful that you are coming to Southern Africa I hope that you will enjoy your stay .We are also fulltime travellers here in South Africa and have traveled Namibia Botswana extensively . I am sure that we will love our stay in Southern Africa. If you have any information about RVing/camping there feel free to email us at karead7@gmail.com. We would be happy to hear your thoughts or recommendations. Thank you for taking the time to comment. We actually saw more of these than motorhomes in that neck of the woods. As you say the night toilet situation can be a problem so best not drink too many beers late on. I believe it, they look like they are fairly popular. No worries, I definitely won't be drinking much after our dinner is over. PS, you may want to check whether it is easier and cheaper to go into Zambia to view the falls, (and there are great walks on that side.) We did it and it was really easy and Livingstone has nice camping at the backpackers. We are already thinking of that! We would love to see them and seeing that we are going to be that close (1,000km, lol) it would be a shame to miss them.